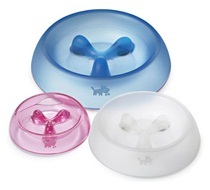 Alpha Paw designs and manufactures innovative dog bowls Eat Better™ and Drink Better™. The unique design is a result of years of research, development and feedback from dog owners. Eat Better™ and Drink Better™ bowls encourage dogs to adopt a slower, healthier pace at mealtimes. See Eat and Drink Better™ bowls featured in ABC News (Youtube).